It’s a little over three weeks away from the winter holidays. Very soon, everybody will seem to be running busy, picking up gifts and sending holiday cards in the mail. 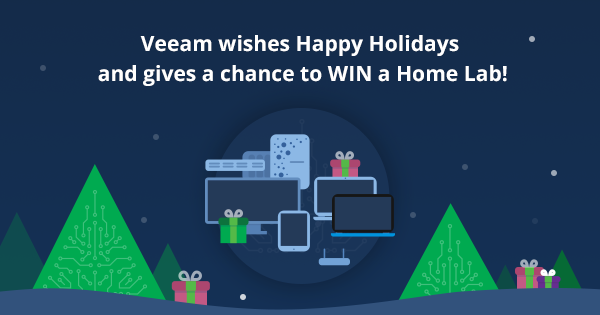 That’s why today we’re launching the Veeam Annual Winter Holidays 2016 giveaway! Everybody gets a chance to win one of many prizes, which definitely will make many of you excited like children. Several years ago, we gave away a great home lab worth $10,000 USD, consisting of different high-tech devices and gadgets pre-selected by Veeam experts. This year, we went even further and let YOU decide what exactly your home lab will consist of! How would you spend that $10,000 value of IT goods? The grand winner will let Veeam be their personal shopper and we’ll get you the IT goods you need to build out your technology wish list. Several other lucky users will win one of seven Holiday Kits which include an Apple Watch, Livescribe 3 Smartpen, Best Practices Veeam Backup & Replication book and more! The last day to register for the giveaway is Tuesday, Dec. 22, 2015. We’ll select all winners at random and announce them on Dec. 23. Follow Veeam on Facebook and Twitter (@Veeam) to be among the first to know!